Bean Bags R Us NewsFabricsHow Does Chlorine Affect Fabric? Bean Bags R Us is dedicated to manufacturing only bean bags of the highest quality, but while the company has models explicitly made for swimming pools, they will eventually be affected by the chlorinated water, causing the colours to fade with time. Unfortunately, chlorine is a potent chemical, and all fabrics are adversely affected when they come into contact with it. Our floating pool bean bags are comprised of durable 60D polyester, however, which is one of the most chlorine-resistant fabrics available. Outdoor pools are subject to all the forces of nature. Wind blows dirt and grime in them, and unless the water is treated, bacteria, fungi and other undesirable forms of life will begin to grow, quickly turning the swimming pool into a cesspool. In addition, all of the germs carried on and in the human body wash into the water, and without some form of treatment, a pool will easily spread infectious diseases. Although swimming pools can be made sterile by adding a specific saline solution, this is a costly option that is usually only used in upscale fitness centres. The most popular method of sterilisation is to add a form of chlorine, the primary ingredient in bleach, but unfortunately, chlorine has the side effect of whitening colour fabrics and eventually dissolving the threads. Because chlorine is so effective at killing germs, it is added to most water that goes through municipal water plants. However, the amount used in tap water is meagre. Otherwise, it would cause problems of its own, including the possibility of death. The amount of chlorine used in swimming pools is much less than that used for washing clothes but higher than that in drinking water. When added to water, chlorine is measured in parts per million (ppm), which is the ratio of chlorine to 1 million units of water. When using the standard guidelines for adding bleach to a top-loading washing machine, the amount of chlorine is just over 80 ppm while the amount of chlorine in a swimming pool ranges from 1 ppm to 10 ppm. One of the most well-known effects of chlorine is that it removes stains from white clothing, but it also has a bleaching effect on nearly all types of colour fabric. 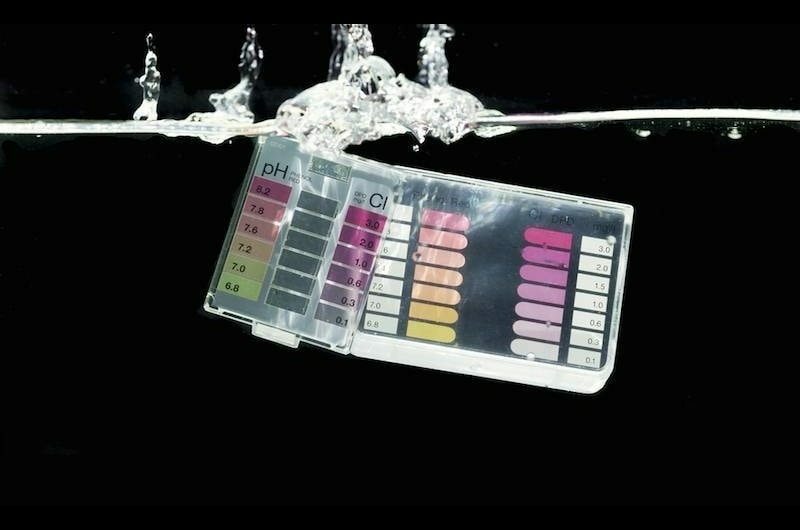 When the concentration of chlorine is more than 80 ppm, the effect is nearly immediate, but in lower concentrations, the fading or whitening is gradual and does not become apparent until after multiple exposures over some time. You may have noticed that after several years of washing clothes, the colours will fade even if bleach is not used. Even though there are other contributing factors, this is partially caused by the small amount of chlorine in the water. You may also have witnessed that a new bathing suit will noticeably fade after only one season of swimming in a pool. The bleaching can be faster in swimming pools if the concentration of chlorine is greater. Chlorine has the additional side effect of reducing the integrity of fabric. The chlorine slowly eats away at the fibers, making them thinner and thinner until they are eventually so small and weak that they tear under normal use. While chlorine is a great solution for protecting the health of swimmers, it is not so great when it comes to fabric. A few types of chlorine-resistant fabrics are available, but none of them are chlorine-proof. All fabrics will eventually succumb to the damaging effects of chlorine. Even though every natural and manmade fabric can be affected by chlorine, some are more resistant to bleaching than others are. The worst of the bunch, however, is cotton. While cotton is soft, comfortable and affordable, it is rarely used for swimwear or material that is made for use in or near swimming pools. Chlorine will bleach and degrade cotton fabric quickly. Lycra and Spandex are manmade fabrics that are commonly used for sportswear, but these are just as bad as cotton is. Chlorine destroys the elasticity of these polyurethane-based materials, making them brittle and causing them to lose their shapes. Nylon stands up to chlorine much better than most other fabrics do, and it dries very quickly, but the combination of chlorinated water and sunlight will still cause the colour of this fabric to fade within one year of regular use in swimming pools. The best fabric for swimming pools is solution dyed acrylic, and this is precisely why it was chosen for the floating pool bean bags from Bean Bags R Us. Polyester is very hydrophobic, which means that it absorbs very little water. Most of the water fails to penetrate the fibres, helping to keep chlorine away from it. However, as mentioned above, no fabric is completely waterproof or fully chlorine-proof. Chlorinated water and sunshine will eventually cause the colours to fade. Because chlorine has an adverse effect on every type of fabric, including polyester, it is best to keep floating pool bean bags out of the water when they are not being used. By putting one of these bean bags in a chlorinated pool only when you need it and take it with you immediately upon exiting, you will significantly extend the colourfastness of the outer fabric. For additional protection, it is recommended that you cover the bean bag with an opaque, water-resistant fabric or store it indoors to protect it from the elements. The impact of rain and the ultraviolet rays of the sun can be just as damaging as chlorine is. While removing your floating pool bean bag from the water will increase its lifespan and keep colours sharp, fading can be further reduced by rinsing it in clean, cool water immediately after removing it from the pool. Some people go even further by removing the outer cover completely and washing it with a small amount of non-chlorinated detergent once per week after heavy use, but you will always want to follow any cleaning directions on the label or included with the product when purchased. Finally, a few specialized products are available for sale that can neutralize chlorine, removing any remnants. These are not necessary except in cases of extreme exposure, but some people swear by their effectiveness even with regular use. The products usually come in powdered form and are mixed with water. The fabric is then soaked in the mixture as directed. The two main ingredients to look for are thiosulfate and sodium metabisulfite. This entry was posted in Fabrics.